Download our free 10 page guide to kickboxing. 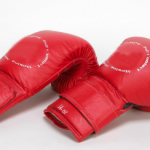 Boxing Gloves: Boxing gloves are very accommodating in increasing the stamina of an athlete. Apart from increasing the level of performance, these gloves come in diverse categories and a person can choose any glove depending upon his requirement. Front end and back end weighted gloves are accessible in the outlets. These gloves are manufactured according to the flexibility as well as adjustability of a person. Protective Gear: In combat against the opponent, certain parts of the body are exposed and these parts need protection from opponents. This is the main reason that athletes make use of these gears so that exposed parts of the body can be saved from possible injuries. Mouth Guard: Mouth guard is used for protecting region around mouth and jaw. This guard helps a person from any impending injury around the area of mouth. Pants/Trouserss: In kickboxing it is necessary to have as much freedom to move as possible. This sport allows free movements to a person and for the successful implementation of these movements; special trousers are made use of. Qualitative fabric is utilized in the manufacturing of these trousers. If trousers are made using quality fabric, then, this fabric facilitates movements and moreover, the comfort level of a person is also increased. 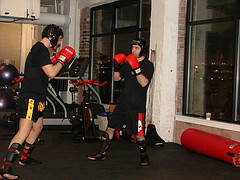 Special hand Wraps: In order to provide maximum safety to knuckles, hand wraps are worn. The wrists as well as fists of an athlete can be protected while coating. Shin pads: These pads are designed according to comfort level of a person and lower parts of the body also require protection from all dangers. So, wearing these pads one can save lower parts of the body and outside injuries are also lessened. Special Kick Boxing Boots: These boots provide utmost security to lower body parts. Lower parts are considered sensitive areas in a body and they require special treatment. So, Special kick boxing booty is adhered to so that lower parts of the body may not get hurt. Protective helmets: Helmets are designed for those players who are playing this game for the first time. The wearing of these helmets is mandatory as they are new to this game. So, above-mentioned equipment is all part of kick boxing game and athletes should take caution to wear these pieces of equipment. Also it is important to remember that your equipment should be in good condition. Things like boxing gloves will become worn over time, and leather gloves can develop cracks. These cracks on the surface of the gloves can cause nasty cust, especially if there is a blow to the head. Having proper equipment is the responsibility of both fighters. If you notice that your opponent has damaged or dangerous equipment you should let the referee know immediately. In some case having improper or illegal equipment will lead you to being disqualified from competition. Equipment for kickboxing comes in various shapes and sizes, this equipment is here to provide you with the safest experience. Safety equipment is necessary to protect you from serious personal injuries. When in doubt ask your coach about proper equipment.